Northern Thai food can be frustratingly elusive. 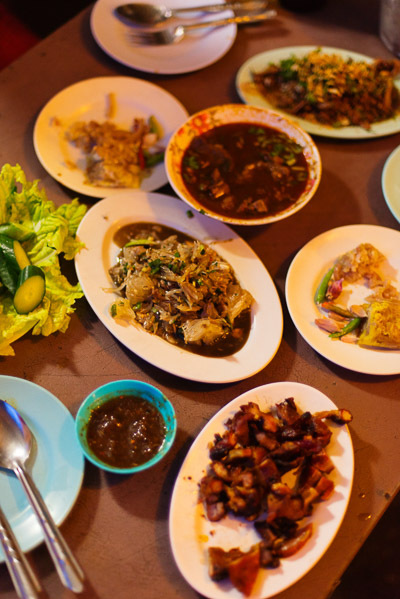 Even in Chiang Mai, the region's largest city and cultural and culinary capital, there aren't many places serving local dishes. And the restaurants that do exist tend to sell similar repertoires of meaty dishes for a predominately male clientele, or are targeted at tourists (of all genders) and tend to lack real northern flavours and ingredients. 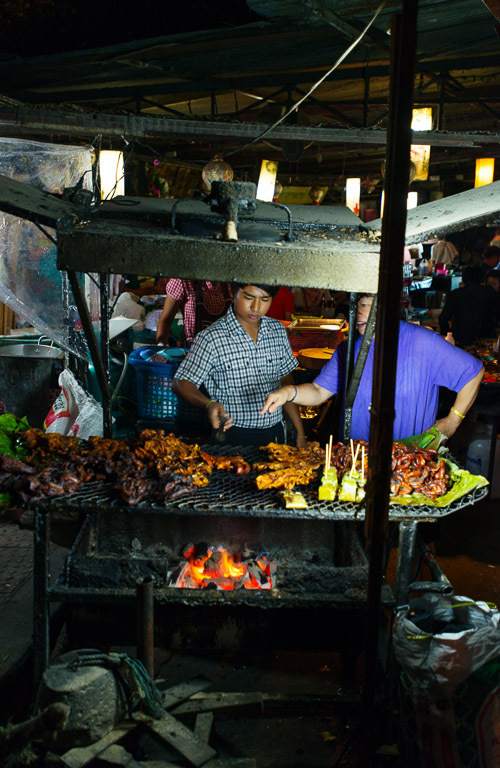 Truth is, if you're in Chiang Mai and want to try good local food, the best option is to make a local friend and try to score a home-cooked meal, or to buy take-away food from one of the city's numerous markets. But there are a few options. Decidedly un-toursity and rooted in the meaty laap mould, but with enough soups, salads and other dishes to claim some diversity, is Laap Kao Cham Chaa. The obscure name is the northern Thai dialect name for the rain tree. The restaurant -- more an open-air gathering of rickety chairs and tables under the eponymous tree -- is open during the day, but I've only ever visited at night, when it's consistently packed with loud, happy eaters and drinkers, smoke from the grill and the blare of western music that never made it in the West. The food isn't going to blow you away, but again, you're going to struggle to find a local place that does this many dishes served with local-style flavour, and with a fun local atmosphere to boot. I like their soups, particularly kaeng awm, a meaty, spicy curry of pork or beef (also shown above), or the tom sop, a vast bowl filled with a spicy, clear broth and beef tendon. They do northern-style laap, which is garlicky, spicy and fragrant, as well as a huge array of northern-style grilled meats -- grilled intestines; sai ua, a northern-style herb-heavy sausage; skewers of peppery beef; jin som, northern-style fermented pork wrapped in a banana leaf -- which are generally just OK. Couple any of these with a basket of sticky rice and a Singha, and you've got yourself a good intro the flavours of Thailand's north. Kao Cham Chaa has a cameo on a recent episode of Anthony Bourdain's Parts Unknown, and Thai-language write-ups of the place (which include more images) can be seen here and here.